The French government has taken steps to minimize food waste, banning large supermarkets from destroying unsold products. They will instead be forced to donate the goods to charities or farms. The National Assembly unanimously voted in favor of the ban on Thursday as part of a larger environmental bill. It explicitly prohibits the practice of intentionally spoiling food so it cannot be eaten. "It's scandalous to see bleach being poured into supermarket dustbins along with edible foods," said Socialist MP Guillaume Garot, a former food minister who sponsored the bill, as quoted by AFP. Under the new legislation, large supermarkets – those measuring 400 square meters or more – will be forced to give any unsold, but still edible, goods to charities which can serve it to those less fortunate. This includes products that were packaged wrong or damaged, or that are past a recommended use-by date but are not dangerous to eat. Food that is past a firm expiration date would go to farms to be used as animal feed or compost. The supermarkets must sign formal contracts with charities by July next year, or face penalties of up to €75,000 (US$83,900) or two years in jail. But Jacques Creyssel, head of the French federation for commerce and distribution, said it is a mistake to only target big supermarkets, which represent only five percent of total food waste. He added that such large stores are “already the pre-eminent food donors, with more than 4,500 stores having signed agreements with aid groups,” the Guardian reported. Meanwhile, some charities are actually against the idea of receiving expired food from supermarkets. Patrice Dallem, from the Red Cross, said it would lead to unaffordable “logistical and human costs,” the Local reported. The new law, which will also introduce an education program about food waste in schools and businesses, is part of an effort by Paris to halve the amount of food waste in the country by 2025. According to official estimates, the average French person throws out between 20-30kg (44-66lbs) of food a year – amounting to a combined national cost of up to €20 billion ($22 billion). 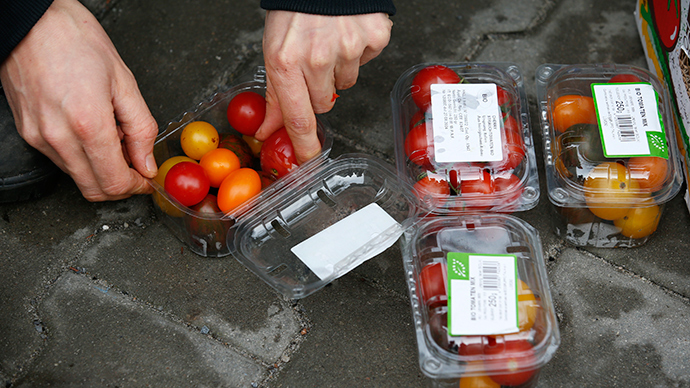 Last month, MPs introduced 39 suggestions to the French government to end food waste. Among them were that French people take home ‘doggy bags’ from restaurants. According to the UN, one-third of food globally (1.3 billion tons each year) is spoiled or wasted before it is consumed by people, causing losses of $750 billion, as well as significant damage to the environment.